I'm starting ti put some color in my DAILY-WEAR! I have so many nice items in pretty colors but somehow I always end up wearing BLACK-WHITE or ALL BLACK! Back in september I purchase these RED-STUDDED jacket from TERRANOVA, a cheap italian brand with all kind of clothes. Never worn it before and with the zara boots, seems the perfect timing to start use it, perfect to wear together. Love your jacket and the clutch! 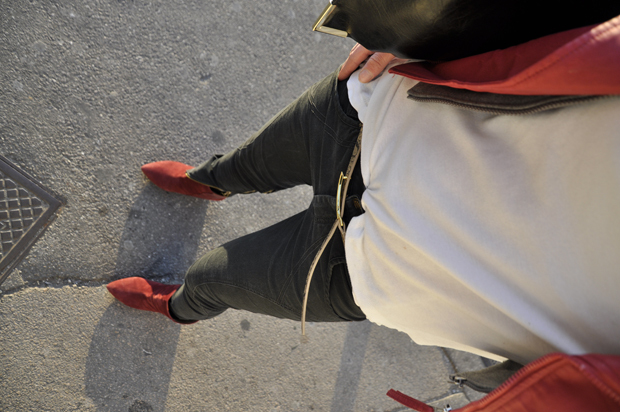 Absolutely love this outfit, the red leather jacket comined with the jeans+hoodie+shoes = perfect! I love so much that jacket! nice outfit! i'm in love with your jacket ! I love this outfit, this is an amazing combination. And I love your jeans. Beautiful blog and posts! Would you like to follow each other? P.S. Wish you an amazing weekend! Your look is amazing, love your shoes!! Wow! that red studded leather jacket!! is AWSOME!! Aww…fantastic outfit ! i like every single piece !